Make the choux pastry as per the recipe (included in "Ingredients", and pipe with 1/2 or 3/4 inch nozzle. Pipe the mixture in rounds onto a greased deep baking tin (even a roasting pan). Cover the pan or tin with two layers of tin foil. Bake in a moderately hot oven (218°C) for 45-50 minutes without opening the foil, as this will cause the steam to escape and the buns to collapse. When they are cooked, remove them carefully, slit to allow the steam to escape and leave them on a rack to cool. 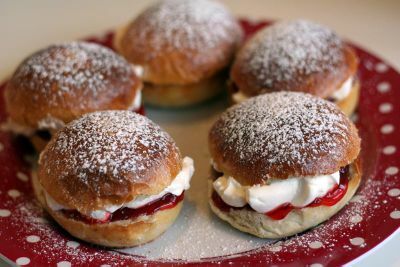 Fill them with jam and cream (or even custard), and dredge with icing sugar - or serve with chocolate sauce (whatever your heart desires).